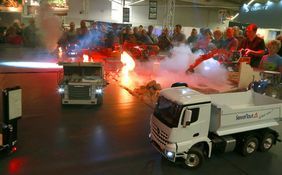 They race, climb steep hills, show realistic functions: Remote control vehicles are an important topic area at the INTERMODELLBAU 2019 exhibition, which will take place at the Dortmund Exhibition Centre from 4 to 7 April. 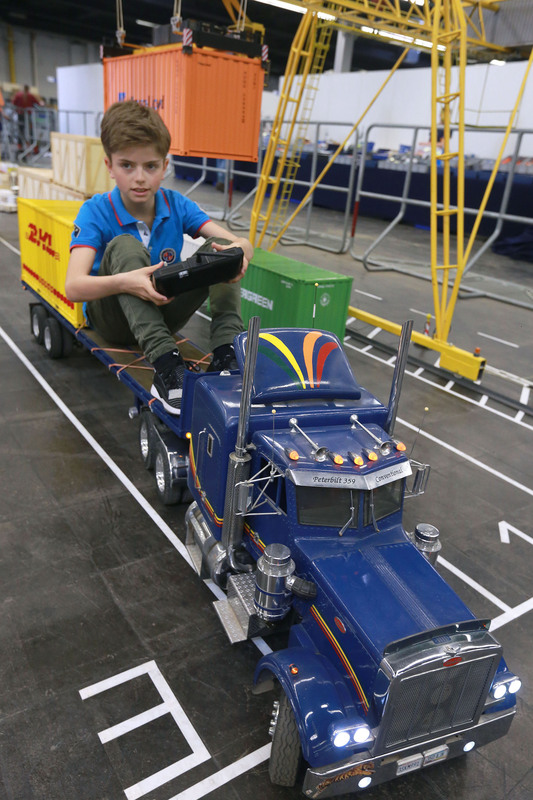 Exciting RC car races and truck demonstrations will also be part of this year’s programme of the world’s largest exhibition for model making and model sports. The German Minicar Club (Deutscher Minicar Club e.V. - DMC) is again the supporting organisation of INTERMODELLBAU and is responsible for RC car events and activities. The German 1:12 Scale Championship in 2019 is already casting its shadows. 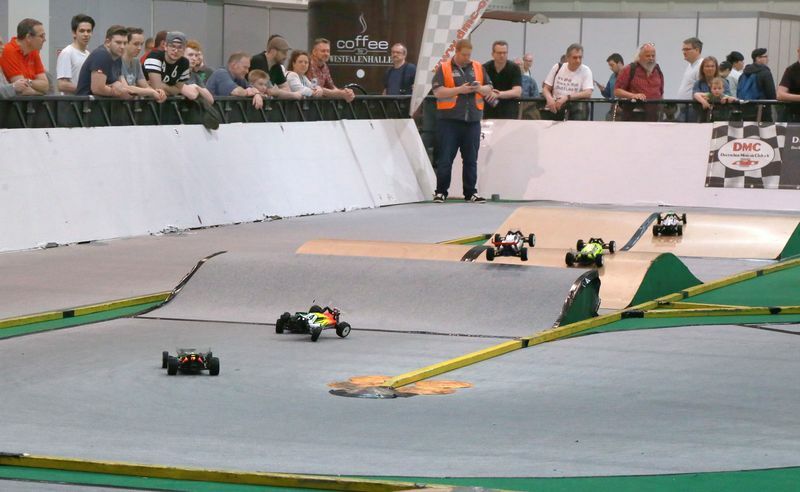 The national title contests in the smallest scale of DMC, the umbrella organisation for remote control model car races in Germany, will be held in front of a large audience. A small volume RC car race will also take place on the opening day of INTERMODELLBAU. The Dortmund Minicar Club contracted for the organisation of the German Championship has done everything to offer the national elite in the EA (1:12 Expert), EB (1:12 Standard) and the 1:12 GT guest classes for RC car races on smooth racetracks the best preconditions for exciting title contests. 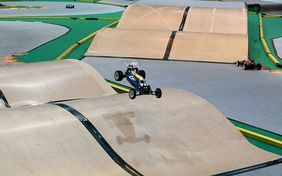 For example, championship record holder Markus Mobers, who was asked to plan the racetrack, has designed a fast and demanding racetrack covering a spacious 20 x 30 metre area. The German Minicar Club and the Dortmund Minicar Club will provide the global RC car scene with the latest results and videos of the traditional German Championship, which has taken place every year since 1980, via Live Timing and Video Stream. Visitors who want to spend more time on the RC car topic can do so in a special exhibition area where vintage cars, entry-level models and racing cars are presented – some of them behind glass in showcases and others in the open for everyone to touch. Young racing talents may also have a go at controlling RC cars on a racetrack and get some first racing driver experience. The ‘Build it up’ show in the Roadworker Arena will also provide a lot of action. Remote-control excavators, tippers and traction units will demonstrate their capabilities there. The vehicles will climb ramps, move earth and extinguish fire. Special effects, like smoke and pyrotechnics, will add a special thrill. 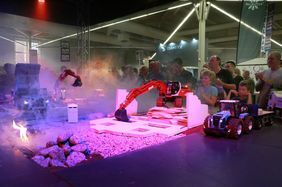 On the sidelines of the show in the Roadworker Arena, experts will share their knowledge with interested visitors, talk about the challenges of making functional models and present new models, construction kits and products. 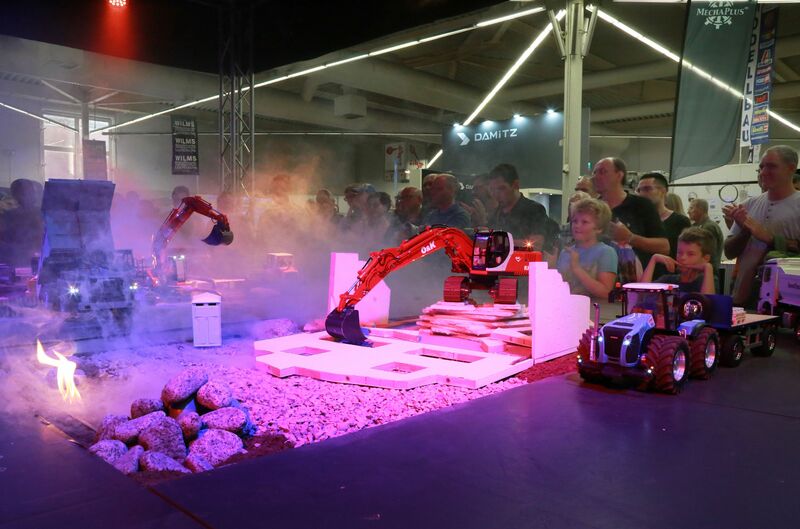 A participation activity for young model making fans will allow children and adolescents to test their skills and control an excavator themselves. The 1:8 Scale Giant Model Interest Group, which has been a loyal exhibitor at INTERMODELLBAU for many years, will show spectacular model lorries, excavators, trucks and agricultural vehicles in Hall 8 again this year. The models weigh up to 150 kilograms and have a length of up to 2.50 metres. Houses, bridges and roads constructed with love of detail can be admired on a 700 sqm course. Particularly impressive this year is the large bridge with a load-bearing capacity of about 600kg and a 10-metre span. The Giant Model Interest Group Team (Interessengemeinschaft Modellgiganten) is again collaborating with the Steam Railway Fans of North Rhine Westphalia (Dampffreunde NRW) in 2019. 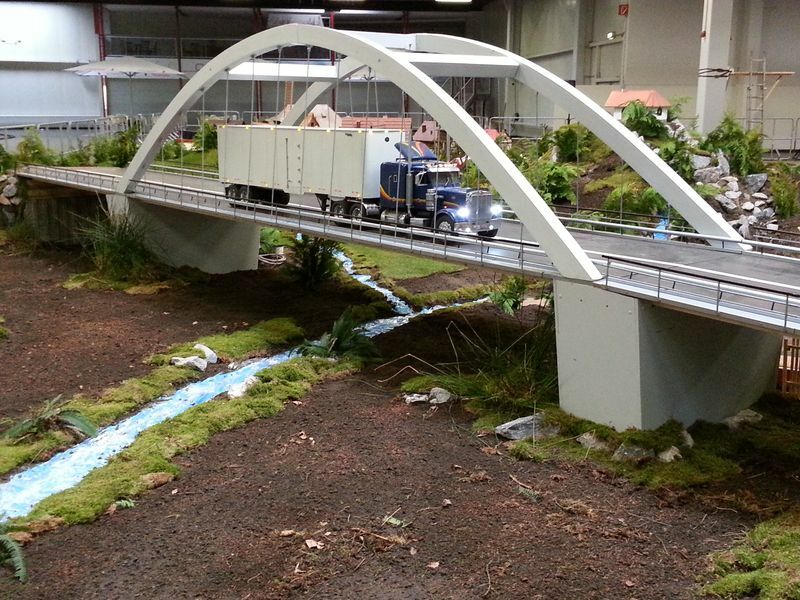 A railway track will lead to the course and show the carriage and transfer of goods from rail to road and vice versa at INTERMODELLBAU. Visitors can also watch the active use of excavators, agricultural machinery and goods traffic during the journey. A goods train will also travel on the rails from the course and be loaded and unloaded by a big (6 x 5.5m) container crane. 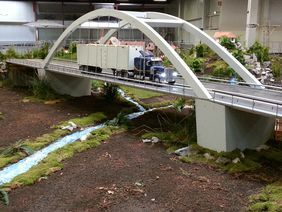 Besides the large 1:8 scale vehicles, many other scales have been given their own dedicated presentation area. Clubs and associations represented at INTERMODELLBAU include the Model Truck Interest Group of North Rhine Westphalia (Interessengemeinschaft Modelltruck NRW) the Cologne-based Truck Modeller Interest Group (Interessengemeinschaft Kölner Truck-Modellbauer), the Dortmund-based RC Truck Car Club ( RC-Truck-Car-Club Dortmund), the Recklinghausen-based Miniature Truck Club (Mini-Truck-Club Recklinghausen), the Soest-Möhnesee-based Miniature Truck Club (Mini-Truck-Club Soest-Möhnesee) and the Berlin-based Truck Modelling Club 88 (Truck-Modellbau-Club 88 Berlin). All of them will show a large number of vehicles with fascinating, often surprisingly realistic features and functions.